Minute black scavenger flies on oxeye daisy. The minute black scavenger flies or "dung midges", are a family, Scatopsidae, of nematoceran flies. Despite being distributed throughout the world, they form a small family with only around 250 described species in 27 genera, although many await description and doubtless even more await discovery. 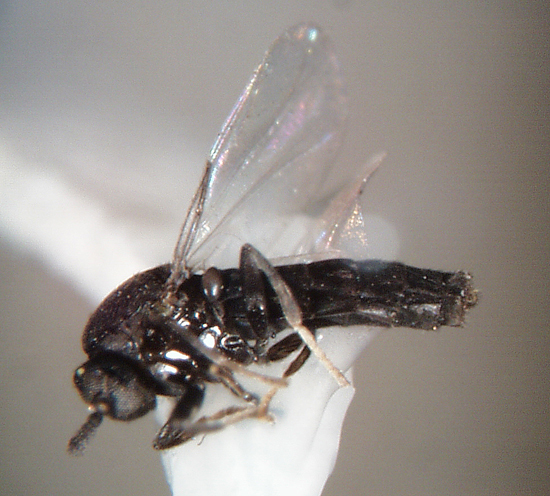 These are generally small, sometimes minute, dark flies (from 0.6 to 5 mm), generally similar to black flies (Simuliidae), but usually lacking the humped thorax characteristic of that family. The larvae of most species are unknown, but the few that have been studied have a rather flattened shape and are terrestrial and saprophagous. Scatopsids are a well established group and fossils are known from amber deposits dating back to the Cretaceous period. Scatopse notata (Linnaeus, 1758) is a cosmopolitan species. Its larval stages are found in decaying plant and animal material. The family name Scatopsidae literally translates to "looks like feces" (from Greek skat "dung" and opsi "appearance"), but this seems to be a misinterpretation. It is derived from the genus Scatopse, which was misspelled as Scatops.